Hi Folks, Tea Party singer/songwriter, entertainer and speaker, Lloyd Marcus reporting in after performing with Glenn Beck at Great Adventure in New Jersey. The rally was awesome. I have attended over two hundred tea parties touring on Tea Party Express. I am continually impressed by the caliber and number of first time candidates across America running for public office; ordinary people stepping up to help take back our country. I also met a couple of black tea party organizers at the Restoring America rally who are planning tea parties in the black community. I asked both gentlemen, "What brought you to our side?" Both said they compared values; tea party values vs Obama and company. Tea party values won. I'm meeting more and more fellow black patriots who have their heads on straight, choosing values over skin color. Do folks in New Jersey have a love affair with breaded deep fried foods? The buffet for the staff and performers at the rally included the most untypical deep fried items I have ever encountered; breaded and deep fried cauliflower, broccoli, asparagus, rice balls and ham and cheese sandwiches. Yes, they made ham and cheese sandwiches, breaded and deep fried them. I'm not complaining. Everything was delicious. Another Jersey thing; a number of people used the term, "Forget about it!" So, here is a message from my extremely fired up, passionate and hard working New Jersey tea party patriot brothers and sisters to the democrats come November, "FORGET ABOUT IT!!" 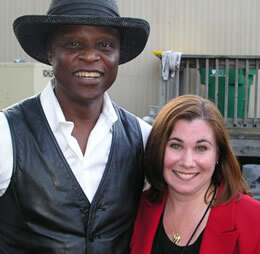 Hi Folks, Tea Party singer/songwriter, entertainer and speaker, Lloyd Marcus reporting in after performing with Glenn Beck at Great Adventure in New Jersey.